With the growth in distributed computing, computer and network resources reside in multiple remote locations and so do the uninterruptible power systems that protect them. Eaton ConnectUPS Web/SNMP cards enable you to monitor and control remote UPSs from Web browsers or industry-standard network management systems. Eaton Relay Interface Cards enable automatic shutdown and network monitoring of UPS system status through a connected computer such as an AS/400 or similar server. Eaton ConnectUPS-X Web/SNMP adapter card for Eaton 5115, 5125, 9125, 9140, 9155, BladeUPS, and 9355 ups systems. Eaton 25 foot communications cable 103004349-5501 for IBM AS/400 model 9406 and newer. DB15-DB9 connectors. Eaton MS slot relay card for AS/400 connectivity through RS-232 serial port. For use with 5130, 9135 and other BD slot ups systems. Eaton AS/400 communications kit includes relay card and 25' communications cable for X slot ups systems including the 5115RM, 5125, 9125, 9140, 9155, BladeUPS, and 9355. For all AS/400 computer systems model 9406 or later. Eaton AS/400 communications kit. 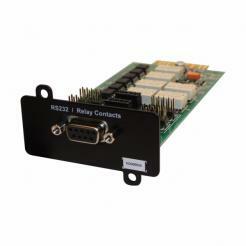 Includes relay card and communications cable for BD slot ups systems including the 9120, 9130, and 9170+. For all AS/400 computer systems model 9406 or later.